Home Sweet Home: Let's Go Recycling! I have lots of empty soda bottles lying on our back yard and I'm thinking of ways of putting those into good use. So, upon seeing this recycling project, I just say....this is it! Do you know that this is a self watering plant container? Did you notice the string connected to the bottle container with soil? This is really neat! 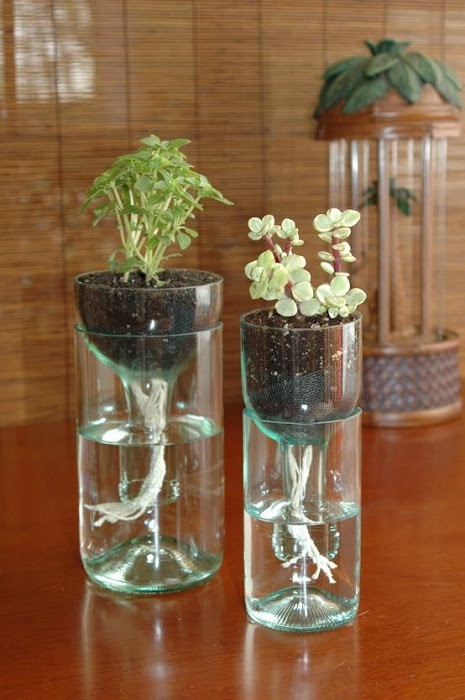 You may use these recycled bottles for your herb garden and it's very easy to do. If you try to cut the empty bottles on the same size, then you can line these up at your patio or at your fence. You may also want to apply some colors by painting the bottles. Awesome! Hmm...just recently, my son is complaining to me that he's getting bored at home this summer, now I have something to assign to him for a week end project. I'm sure he would enjoy doing this with his little sis. It is a great idea! I want to try this one. That's very cool! I wonder how the soil doesn't fall through. Maybe this is good for a hydroponic herbal plant? I think that could also be used for that purpose Sis. About the soil, there is a screen lined underneath to protect the soil from falling. Nice idea. Madami din kami empty bottles and I will tell daddy about this. Thanks for sharing this!I would make my girls on vacay do this too! This is what mommy told me. What a clever way to recycle bottles instead of selling it to junk shops. I think this will also work for plastic bottles. I will try this at home. Wow! What an exciting way to recycle stuff. You can put this one at the garden area or in the front lawn too noh? Nice! Oo nga this is so neat looking. And convenient because you don't need to water the plant every time.